The figure used for this unit is a Reapers Minis figure from the Legendary Encounters set. The name of the figure is Minotaur of the Maze. Character Bio: Dwelling in the Maze was the Minotaur. This mystical being from Feylund relentlessly preyed upon the poor men let wandering alive in the Maze. Many time have armies of valiant troops tried to bring the beast down, only to never return, as the Minotaur is not an opponent for the puny weapons of mere mortals. Their blows never seemed to pierce the thick hide of the Minotaur whereas he furiously charged and wreack havoc in their ranks, unconcerned by their blades or pikes. It is said, however, that some day a true hero would appear, blessed by the gods. Faced with this Hero, the Minotaur will finally bleed, and after a long battle will be left dead on the ground. The Hero will emerged victorious from the Maze, the first man to ever do it, carrying at his wrists the ornaments of the beast horns. Or so said the legends. Instead of moving and attacking normally with Asterios, you may move Asterios up to 5 spaces. Asterios can attack up to 3 times with Furious Charge Special Attack at any point before, during, or after this move as long as Asterios is on a space where he can end his movement. Asterios cannot attack the same figure more than once on a single turn. Asterios will never take any leaving engagement attacks from small or medium Squad figures while using Furious Charge Special Attack. 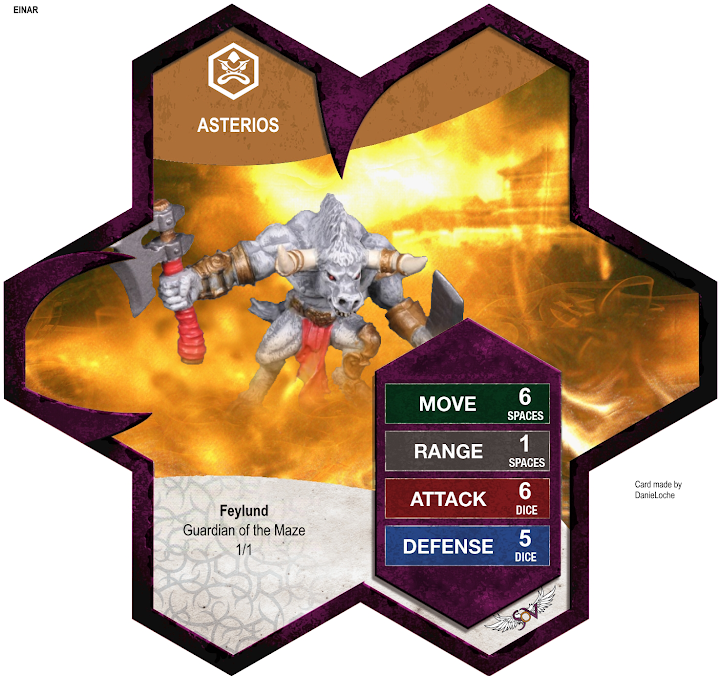 When rolling defense dice against a normal attack from small or medium Squad figures, Asterios receives 3 additional defense dice. Last edited by superfrog; January 18th, 2019 at 02:01 PM. From my memory, is this the first special attack that grants an additional ability without having to attack? In this case disengage? Referencing the other movement special attacks, Kumiko already has disengage and I don't believe that Augamo gains it. If that's true then this would be the first special attack where you might want to use your special attack without attacking? Is that within the rules? Example being wanting to disengage freely from a figure you don't want to wound (Krug, 1 lifee viking spirit, chokepoint holder...) or if you want to make a beeline for kelda or a treasure glyph in TQ. So Aesterios is the Minotaur from the original myth, but he's from Feylund? How on Earth did this guy end up on another planet? He's not from the myth, the maze he's in is on feylund. Yep, that's what I gathered too. He's based off a Greek myth, but twisted into the Heroscape universe, sort of like how Sudema is to Medusa. Who exactly is Theseus? I'm personally thinking/hoping that he's one of the Kresnik, like Van Nessing. He's definitely a character whom I think would be interesting to see come to life in fanscape. I guess we didn't really think to use the existing basic information you gave in the submission, because I think it was the first submission to actually include a full basic side, and so we weren't used to it at all. It's a miracle that we happened to come up with the same stats as you did! It is within the rules to do so, at least as far as I can tell. Also notice that it is only 5 move rather than the normal move of 6, so it's not just a straight advantage. If that's true then this would be the first special attack where you might want to use your special attack without attacking? Is that within the rules? So someone can correct me if I'm wrong, but this is the first special attack you can activate and not actually attack. Is there a precedent for such a thing? EDIT: Btw, I should say that I love this unit. Fantastic sculpt and the application of the design intent was really well done. I look forward to games with this guy to see his impact. Bravo @French Community;. - Othkurik's Embush and Kozuke's Charging Assault can allow them to add 1/3 to their move without attacking. Those can be strange Embushes and Assaults, aren't they ? - Goblin Cuttes' Scurry give them Disengage only when they use it. - And the most important : Eltahale can use Thunder Step without attacking ! It's not a Special Attack, but same result : you can give her Disengage and a no-high-limit move of 5, without attacking, even if it's the first aim of the power. Last edited by DanieLoche; April 13th, 2015 at 06:11 PM. But the bio references Theseus the GREEK hero who killed it. Was Theseus a soldier summoned to Valhalla and spread the story when he got back to Earth. Or am I just way over thinking this? Probably the latter.